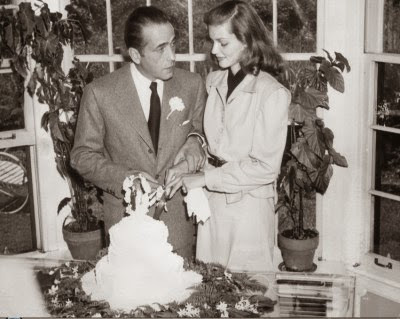 Humphrey Bogart and Lauren Bacall were married 70 years ago today (May 21) at Malabar Farm in Lucas, Ohio. Here's the happy couple cutting the wedding cake after the ceremony. The rolling hills of central Ohio are usually havens of tranquility, but they became paparazzi central on May 21, 1945, when movie stars Humphrey Bogart and Lauren Bacall got married on a rural farm owned by writer Louis Bromfield. Bromfield was a Pulitzer Prize winning novelist, who also worked as a screenwriter in Hollywood. He worked on the scripts for Dracula (1931) and Brigham Young (1940) and his novels The Rains Came (1939), and Mrs. Parkington (1944) were turned into successful movies. Bromfield grew up in Mansfield, but his travels as a writer took him to New York, India, and France. Bromfield returned to Ohio in 1938 because of the outbreak of World War II. He bought around 1,000 acres of farmland in a rural area known as Pleasant Valley and set about becoming a gentleman farmer. The entryway to the big house at Malabar Farm. 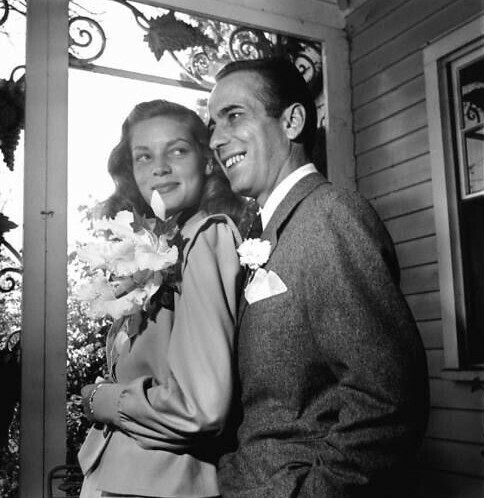 Bogart and Bacall were married there on May 21, 1945. Bromfield became a renowned conservationist, and the organic farming techniques he used at Malabar are still studied around the world, but he was also a generous host who loved bringing his many celebrity friends to Ohio for a weekend on the farm. Bogart was one of Bromfield's oldest friends so he happily hosted the wedding of two of the biggest movie stars in America. 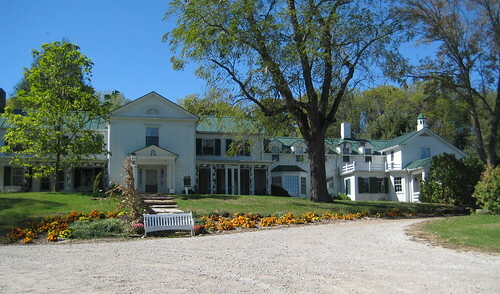 The big house at Malabar Farm. Bogart and Bacall met on the set of To Have and Have Not (1944), director Howard Hawks suspense thriller about a boat captain who becomes involved with the French Resistance and a femme fatale (Bacall). Bogart, who was coming off Casablanca (1943), was one of Hollywood's biggest stars, and the 19-year-old Bacall became an overnight sensation for playing Bogart's tough, but tender love interest. The co-stars fell in love while filming To Have and Have Not, but Bogart was still married to his third wife, actress Mayo Methot. He finally obtained a divorce in early May 1945 and a wedding date was set. Louis Bromfield at Malabar Farm with two of his beloved boxers. The local newspaper, The Mansfield News Journal, provided lots of wedding coverage for its curious readers. 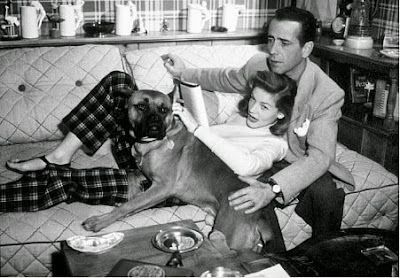 There was zero chance the Warner Brothers publicity department was going to let its two biggest stars marry in secret, so dozens of reporters and photographers followed Bogart and Bacall "around like house pets," according to News Journal Reporter Marguerite Miller. The common opinion among locals was that the couple were "swell folks," but they did get some movie star treatment at the local courthouse. The blood test was hurried along to accommodate the couple's schedule, and officials overlooked some residency laws to give them a marriage license (Bacall put down Lucas as her place of residence just in case). Lauren Bacall and Humphrey Bogart on the front porch of the big house at Malabar Farm on their wedding day. 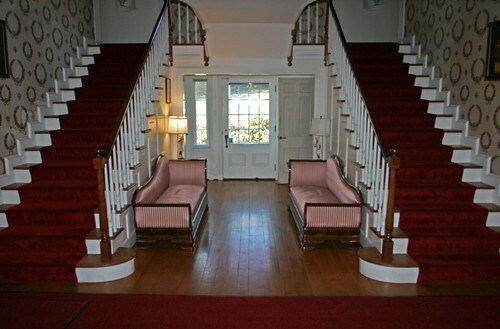 The ceremony took place at the double staircase in the entrance of the big house, a Greek Revival style farmhouse designed by Bromfield and architect Louis Lamoreux. The couple were married by a local judge with Bromfield's prize boxer Prince sitting at his feet (The Bromfields had several boxers, but Prince was the only dog allowed at the wedding because the raucous canines had a habit of soiling the carpet and breaking the furniture). Bromfield was the best man and Bacall's mother, Natalie, was matron of honor. Bromfield's daughter, Hope, played the wedding march and the Malabar staff were the wedding guests. 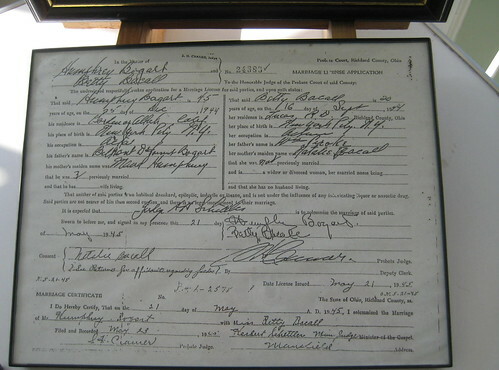 A copy of Humphrey Bogart and Lauren Bacall's marriage license. Her real first name was Betty. In her autobiography, Bacall remembered her wedding dress as "a pale pink wool suit," but Miller had a much more elaborate description for News Journal readers. The suit was "doeskin in a delicate rose-beige shade fashioned along simple but attractive lines. Her brown heeless pumps were of perforated garbardine trimmed with matching faille bows," Miller wrote. 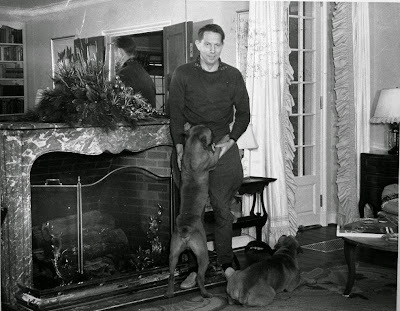 Lauren Bacall and Humphrey Bogart with the boxer puppy Louis Bromfied gave them as a wedding present. After the ceremony, the couple cut the cake, and Bacall threw the bouquet (Hope caught it). The next day, the couple returned to Hollywood. They were married until Bogart's death in 1957. Today, Malabar Farm is an Ohio State Park. Visitors can tour the big house and see where Bogart and Bacall were married. The farm also has a replica of the wedding cake and several photographs. Here's a video with Bogart and Bacall's son, Stephen, and Tyrone Power Jr promoting Malabar and the other movie themed destinations in central Ohio (The Shawshank Redemption was filmed in nearby Mansfield).